Get all your pickaxes ready! This new civcraft structure will be your best friend. Coming soon to a MineTexas Civcraft Minecraft Server near you! The Quarry is a unique structure that replaces mining by allowing miners to put their pickaxes into the Quarry mine for them. The Quarry consumes the pickaxes and in return has a small chance of generating Iron, Gold, Diamond, Emeralds and Tungsten Ore. The Quarry excretes cobblestone with a 1:1 ratio as a bi-product of the mining. 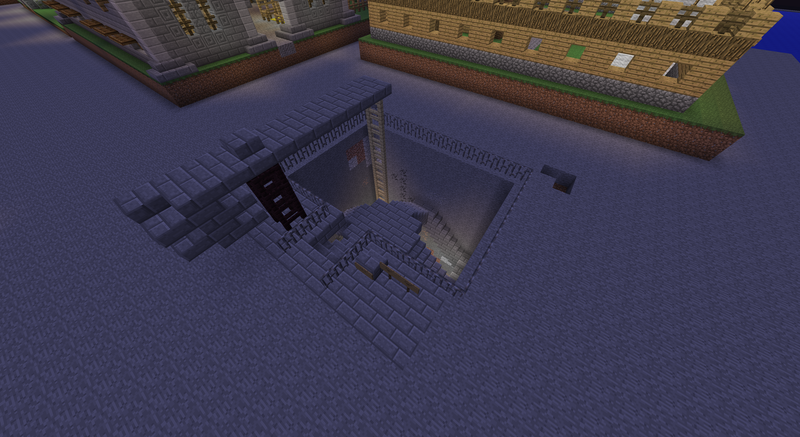 Both the cobblestone and the precious minerals are stored in a single double chest. If the storage chest becomes full the structure will jam and stop working until the storage chest is cleared. It is important that the Quarry's storage chest is emptied often or it will not function. The Quarry is very simple to operate, simply select the pickaxes you wish to deposit it into the input chest. The Quarry will then start mining with it and sometimes, if you're lucky, precious minerals. As of Civcraft 1.6, you can now purchase upgrades to the Quarry. These upgrades allow the Quarrys in your town to use higher levels of pickaxes: Stone, Iron, and Diamond. Any info as to what this new structure will do? I'm aware. The wiki had to be taken down. I'll get it hosted somewhere else, soon. I have updated the main post with the content from the wiki, since the wiki is down. Any word on when this will be implemented on rivendell? I can get it implemented tonight. I have a number of other fixes to put in place as well. The Quarry is now on Rivendell.